Mike Schmitz takes a look at the strengths and weaknesses of Kendall Marshall with the help of North Carolina game film, commentary from head coach Roy Williams, and analysis from Marshall himself. Kendall Marshall: "I Can Adjust to Any Situation"
An interview with North Carolina point guard Kendall Marshall, discussing his training regimen in Florida, what he's working to improve on, his relationship with his teammates and coach Roy Williams, how he prepares for games, his injury, the transition to the NBA, and more. Kendall Marshall: Right now I'm down at IMG Academy in Bradenton, Florida. I've been down here since my last final, which I think was on the fourth [of May]. I've just been working every day, rehabbing every day. The main thing I'm trying to do is just take care of my body. I don't just want to prepare for the NBA draft; I want to prepare for an 82-game season. So, a lot of flexibility, a lot of stretching; learning the right way to take care of my body over time. And of course, rehab. It's been hard to do everything on the court with my wrist and elbow, but I've been able to shoot a lot, still do workouts, a lot of left-handed. I almost wish I would've broken my left hand so I would've been able to get a lot better with my right hand, but it happens like that sometimes. That's pretty much what I've been doing -- the same schedule every day. JT: What does your typical daily schedule consist of? Kendall Marshall: A typical day is breakfast at 8:00. Rehab from 8:30-9:00, then we start warming up and stretching, then we have a field workout, which is a lot of motion, agility, working on becoming quicker -- things like that we do outside. We go out there for about an hour to an hour and 15, then we go into the gym. We do basketball workouts, a lot of ball screens and a lot of shooting. Dan Barto does a great job with us. We go to lunch around 1:00, then we get a little break from 2:00-4:00. At four we come back and we have different vision testing or group settings where we prepare for interviews, things that make you appealing, things like that. At 5:15 we weight lift -- four days a week: upper body two days, lower body two days. We have another basketball workout after that, which can either be playing, shooting, or working out -- we never know until we get there. JT: That sounds pretty intense and has to be kind of tiring. It sounds like you're basically working 12 hour days. Kendall Marshall: Yeah, that's about right. I wake up every day at 7:22 and I usually get home around 7:45, so it's a full day, but it's great because we're isolated, there's no trouble we can get into down here -- it's all about working hard and getting ready. JT: We've heard there are a lot of other players down there preparing -- how does that help you out? Is the competition good there? Kendall Marshall: It helps out a lot, because when you're around people that are all pushing to accomplish the same goal as you, it makes you work harder. A little ongoing joke we've got down here is who's working hard, who's taking who's money. Given that we're all professionals, that's realistic -- you don't want anybody outworking you and taking your potential money. So we've got guys down here like Moe Harkless, DJO [Darius Johnson-Odom] from Marquette, Bernard James, just to name a few. And we all push each other, so I think we'll all have a good showing in this next month and hopefully everybody makes a roster. JT: What do you think your biggest strengths are as a player and how would you sell yourself to an NBA GM? well, I'd ask I my teammates to do it. I feel like if you want to know about a player you should ask who he plays with or who he plays against and they'll give you an honest evaluation. Now I can sit here and say I do a great job of running a team, getting my teammates involved, and ultimately winning -- those are the things I take pride in and I think my teammates would be able to vouch for that. JT: Have you been keeping in touch with Harrison Barnes, John Henson, and Tyler Zeller as they've been preparing for the draft? Kendall Marshall: Not so much Z[eller]. He's on his own a lot. But me, John and H[arrison], we talk pretty much every day, whether it's what players we're working out against, who's good from these small schools that you don't hear about too often, and the crazy workouts we're all going through, so we're all sharing stories. JT: Looking to the NBA, is there anything you feel you could really improve upon or the thing you're spending the most time working on from a skills perspective? Kendall Marshall: Definitely. I definitely want to become a consistent, knockdown shooter. The last thing I want to be is a liability for any team I'm playing for. I feel like I'm blessed with a gift of getting my teammates involved, but that's not going to matter if guys are defending 10 or 15 feet off of me. And also, working on my body and becoming more flexible -- I think that will help me become quicker on defense. You know, being able to keep guys like Tywon [Lawson], Derrick Rose, and Russell Westbrook, these highly explosive guards -- I'm not trying to shut them down, but I want to be able to contain them and do a good job staying in front of them. JT: You obviously excel with your point guard game and passing ability, which made your scoring game take a backseat at times. Do you think some people undersell your abilities as a scorer because of that? Kendall Marshall: It's tough to say. One thing I think I do a great job of is I stay in my lane. Whatever I'm able to do, you're going to see it, but I'm not going to try anything crazy that I can't do. I feel like that's one area if I just do what I'm supposed to do, as opposed to going out here and just showing people I can score 25 if I wanted to. JT: Can you talk a little bit about how you prepare for the game as a point guard, balance your scoring and passing, the pre-game work you put in watching film and game planning? Kendall Marshall: A big thing for me is matchups. I feel like the easiest way to score is when you have mismatches. So I want to attack mismatches as much as possible, whether I see that in film or the first couple times down court, a sub comes in -- I want to exploit matchups as quickly as possible. I was blessed this year to have players who were usually better at their position no matter where we wanted to go, so my teammates definitely made it easy for me to prepare for games because they were prepared. JT: What it was like to be injured amidst your team's NCAA Tournament run? 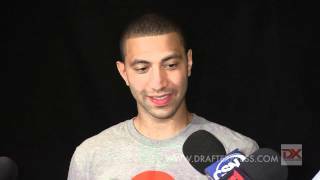 Kendall Marshall: It was very tough. I don't wish that on anybody. I don't think that's something anybody ever wants to have to go through. But it was a learning experience, and I'm proud of my teammates for the way they fought. I still feel we had a very special season. We had expectations placed on us that we felt were extremely realistic, but obviously we weren't able to do that. But watching from the sidelines, you see a lot within the game -- maybe stuff coaches were yelling at you for when you didn't think you were doing anything wrong. So, it was a blessing in disguise to be able to take a step back and see the things the coaching staff talks about. JT: Do you feel any regrets leaving school given how your career at the NCAA level ended? Kendall Marshall: Not at all. I feel like we still had two extremely special seasons while I was there. I wouldn't want to trade those memories with my teammates for anything in this world, but I also believe that I want to be able to follow my dreams. Everyone's window of opportunity isn't the biggest to go to the NBA. There are some players that are blessed that no matter when they leave, there's a good chance they're going to go where they want to go. I feel like with a player like myself, I have to take the opportunity that's given to me. Everybody's dream is to play basketball at the highest level, and if I can take that opportunity I'm going to take it. JT: Was it a difficult choice declaring for the draft? Not really. I think one thing that makes me special are the players around me, and when those guys are going to the next level, and I'm playing my best basketball, the writing is on the wall. It felt good to have coach's support behind me. When I walked into his office I was kind of scared to let him know, but the first thing he said back to me when I told him I was ready to leave was that he had zero problems with that. He went on to tell me the steps from there. That was definitely comforting for me. JT: What it was like to play under Roy Williams, your relationship with him, and how that's helped prepare you? Kendall Marshall: He's the best coach I've ever had. He runs a pro system and I think he does a great job getting the most out of his players within a team concept. When you're coaching at places like Kentucky, Duke, UCLA, Kansas -- teams that are great year in and year out, one of the biggest things to do is manage egos of these players that are coming out of high school and who all averaged 25. So I have a lot of respect for Coach Williams and how he's able to do that. JT: You talked about some of the great schools in the ACC. I wanted to ask you what it's like holding the ACC single season assists record given you played in the same conference as Bobby Hurley, Chris Paul, Ty Lawson, and so many other great point guards. Kendall Marshall: It's definitely an accomplishment I'm proud of, but those names you mentioned, none of those players were satisfied with that. So at the same time, it's humbling to me that I so have so much more to accomplish. I don't want to just be known for what I did one year in college, but for what I'm able to do over my whole career. JT: Have you received any advice from other NBA players and/or UNC Alumni about preparing for the next level? Kendall Marshall: The biggest thing I've been told is about taking care of your body. Everyone I've talked to, they have complete faith I can play at the next level, but they say that's the thing that gives you longevity, being able to withstand those 82 games over the time of your career, so that's one thing I want to focus on: the stretching, the rehabbing, getting the most I can out of myself. JT: You weren't a starter from day one when you arrived at Chapel Hill, and once you got your opportunity you clearly took advantage, but do you think the experience of having to wait your turn so to say will help you at the next level? Kendall Marshall: Without a doubt. I can remember plenty of games when sitting on the bench or after games I'm thinking I played 12 minutes, had six points and six assists, imagine what I can do with 30 [minutes]. But coach knew what he was doing; obviously I wasn't ready at the time. I can think back to games when he did put me in at crucial times and I didn't perform well. I think he went about it the best way for me and the team, and it's going to help me at the next level. These coaches, they coach the way they do for a reason. College, the NBA -- I'm pretty sure they know what they're doing, so I'm just going to take it as a learning experience and learn from it. JT: Looking to the NBA, is there any player you model your game after or think you compare well with stylistically? Kendall Marshall: You know, it's tough. I feel like I have a really unique game, so it's hard to really model my game or take after anyone. There are players I've enjoyed watching, such as Marcus Williams at UConn, Cliff Hawkins at Kentucky; I love watching Rondo now. If anything, I try to take a lot of ball fakes out of Rondo's game. I feel like he does a great job of ball control even without dribbling, but other than that it's hard to say I model my game after anyone. JT: What would you say to your doubters who look at you and say "he's kind of a unique player, he doesn't really resemble anyone, I'm not sure if he'll be able to succeed"? Kendall Marshall: You know, people don't like different, people don't like change, that's just the way our world works. I think there have been plenty of players who have fought against those questions and done well. Players like Evan Turner, who some didn't think would do well coming out of college but has done a great job. Players like Ricky Rubio coming over to the NBA and being able to be successful, just to name two. Players from the old days like Mark Price who weren't gifted with the athletic abilities but still found a way to get it done. But I feel like I can fit right in -- not with those crop of players, I may not be as good as them right now, but still being able to be effective. JT: Is there any coach or team in the NBA you think you'd be a real good fit with? Or a certain style you prefer to play? Kendall Marshall: It's tough to say. I feel like I can adjust to any situation. It's probably be a little bit harder for me if coach gave me the ball and told me he'd like me to average 20 a game, but other than that I think I'll be okay. JT: Thank you very much, Kendall. We appreciate it. Good luck moving forward. We wish you well. Kendall Marshall: Thank you, I appreciate it. After a solid freshman year where his performance really came on strong late in the season, Kendall Marshall picked up right where he left off as a sophomore, playing a pivotal role in leading North Carolina to a #1 seed in the NCAA Tournament. Unfortunately for Marshall, his season was unexpectedly cut short following a superb 18 point, 11 assist performance in a Round of 32 win over Creighton, as he broke a bone in his wrist late in the game and was unable to return before the Tar Heels' own season ended two games later in the Elite Eight. Marshall had a superb season in Chapel Hill by many standards, which can be evidenced by looking at his statistical accomplishments in relation to the rest of our database. It's no secret that Marshall's game centers heavily around his fantastic abilities passing the ball, which look even more impressive when you view them in a historical context. Marshall's 10.7 assists per 40 minutes game adjusted this season rank the highest of any player in the history of our database (which goes back to 2001/2002). He's also #1 all-time in Pure Point Ratio by a large margin, while his 3.51 Assist-Turnover Ratio ranks 3rd all-time.. When looking at Marshall's game from an NBA perspective, his passing ability is clearly his greatest selling point, and it's hard to overstate how good of a passer he is and how great a feel he has for managing a game. In terms of point guard style, Marshall is a prototypical pass-first point guard taken to the extreme, as evidenced by his just 6.2 field-goal attempts per game in 32.9 minutes. He possesses an uncanny, second nature feel for the game, always instinctively playing with his head up and quickly moving the ball to the highest percentage scoring opportunity. Managing the game clearly comes very easy for him both in the half court and transition, as he looks as natural as any player in the country finding teammates for easy baskets. Marshall possesses the full slate of passing skills, possessing excellent vision and the ability and willingness to make all types of passes, excelling especially in transition, on pick-and-rolls, and finding open shooters all over the floor. He does a great job reading the floor and finding openings, while being quick to get the ball out of his hands as soon as an opportunity develops, not being as ball dominant a player as one would expect given his gaudy assist numbers. Marshall only averages 3.1 turnovers per-40 pace adjusted, but that number is slightly misleading due to how little he looks for his own offense, which cuts down the opportunities for turnovers in that area of his game relative to other players. Just accounting for possessions used, Marshall was the third most turnover prone prospect in our database this season, coughing the ball up on 27% of his possessions. As he readily admits, he is prone to taking too many risks with his passing game at times, trying to make homerun plays or leaving his feet before he makes a decision and relying on his vision to bail him out, which leads to some unnecessary turnovers. While this is something a coach will need to live with considering how brilliant of a distributer he is, this is something he'll need to account for in the NBA where every defender will be bigger and more athletic, lowering the margin for error on all passing windows. While Marshall clearly cemented his status as an excellent distributor in his breakout sophomore season, many of the same questions remain in his rarely utilized scoring game, as his pace-adjusted efficiency and production numbers stayed pretty stable this year. Marshall's 7.9 points per 40 minutes pace adjusted ranks second worst of all players projected to be drafted this season, and his 55% True Shooting Percentage is towards the bottom as well. While Marshall improved his scoring output all season long (nearly doubling his scoring rate in March), and looked extremely aggressive in a few extremely high-profile matchups, he still has many concerns heading to the next level, namely whether he'll be willing and able to score enough to keep an opposing defense honest. The most encouraging improvement for Marshall is the increase of his anemic 43.4% FG% on two-point baskets this season to a more respectable 50.7%, but he's still doing it on just 4.0 attempts per game and is also getting to the free-throw line at a slightly lower rate. Marshall has done a better job being decisive going to the rim, taking advantage of gaps in the defense when they present themselves and using his size to finish around the rim, but still is not very impressive in this area. Marshall's first step is below average and despite excellent craftiness and a good ability to change speeds, he lacks the top gears most NBA guards have, which often prevents him from getting to the second level on drives. His lack of elevation around the rim is also concerning projecting forward, so developing a floater would be wise for diversifying his scoring ability in the lane. As a shooter, Marshall has similarly remained mostly stagnant with his development as a sophomore, as he's shooting a respectable 71.2% from the free-throw line, and 35.1% from three-point range, but doing so on a very low 2.2 attempts per game. The bright side here is his 1.35 points per shot on unguarded catch-and-shoot jump shots according to Synergy Sports Technology is a more impressive number, and that bodes well for his chances of expanding this area of his game projecting to the next level, where he could play in the same backcourt with another playmaking combo guard (perhaps a Monta Ellis type). Marshall's shooting success is still in spite of his somewhat awkward albeit passable mechanics, which shows more potential for improvement if he can refine his motion some. The defensive end, however, is perhaps the most concerning aspect of Marshall's game projecting to the next level, as his lack of quickness on this end of the floor is concerning in the dribble-drive centric NBA, and already is a problem against high level competition in college. While Marshall brings a good effort and fundamental level to the table at the college level, he is prone to being blown by more athletic competition due to his below average lateral quickness, and often has to give up notable space on the perimeter to compensate. His excellent size allows him to offset his other limitations somewhat, notably in the pick-and-roll game at times, but overall his ability to defend point guards consistently is a question mark projecting to the NBA, and he will really need to put in work to maximize his effectiveness on this end of the floor. Looking forward, Marshall's superb passing ability, feel for the game, excellent intangibles, and penchant for playing winning basketball are certain to be attractive to NBA teams, as there simply aren't many players who can run a team like him available, certainly not in this point guard-starved draft class. The recent seamless transition of Ricky Rubio, a player with a similar strength/weakness profile in many ways, will also help the case for those wondering how Marshall's game could translate to the pros, as will the continued success of Andre Miller, another guard he somewhat resembles. Maximizing his spot-up shooting and defensive abilities are definitely the simplest short-term and long-term improvements Marshall can make, and both would go a long way to easing his transition and rounding out his game. Playing in an unselfish offensive system under a coach that recognizes how to utilize his skills will be critical for Marshall's long-term success, but it's difficult to see a player with such a pronounced and coveted strength not finding a niche in the NBA. Kendall Marshall also looked significantly better in both sessions than he did during McDonalds practices. A big point guard without freakish athleticism, Marshall stood out today distributing the ball off the dribble. Showing terrific creativity when threading the ball through traffic when he gets into the paint, Marshall may not have a fantastic first step, but he changes direction on a dime, has a tight handle, and is always looking for his teammates, often at the expense of his own offense. Showing a savvy array of scoops around the basket when he did look to score, Marshalll is clearly prepared to compensate for his lack of great leaping ability on the next level with his current offensive repertoire. Here is an interview (and highlight reel) we conducted with Marshall last week, which perfectly highlights his outstanding intangibles and unselfish nature, things that will greatly benefit him in making the transition to the high level of college basketball. This wasn't the greatest game for the UNC-bound point guard, as his team was severely overmatched in talent and his teammates did little to help him out, but there was still reason to be impressed with what Kendall Marshall (#21 Scout, #32 Rivals, #19 ESPN) brought to the table. Offensively, it's much the same story from the last time we profiled Marshall, as he has a tremendous feel for the game along with good ball-handling skills with either hand. What really stands out about his game, though, is his ability to pass the ball, as he frequently makes all kinds of advanced passes, be it no-look passes, one-handed passes with either hand, cross-court passes, or some combination of the three. If anything, he seems to rely on these things a little bit too much, favoring making many of his passes in mid-air when it's not necessary, but that should be something he adjusts early on in his college career. Marshall's biggest problem in the game today was that his teammates either couldn't finish his passes or couldn't catch them, with a few bounces off the chests and hands of his teammates, leading to him tallying just 1 assist against 7 turnovers. From a scoring perspective, Marshall is less impressive, mainly due to his perimeter shot, which is just respectable at best. He has no problem launching away from three-point range, and his shot appears to be on line most of the time, but he suffers from a lack of arch, leading to some line drive misses. He's more impressive attacking the basket, where he can take advantage of his strong frame and creativity, finishing on an array of impressive moves here, be it floaters or reverse lay-ups. He's extremely crafty with the ball, both handling and scoring in the lane, and he definitely has a very advanced feel for the game in general. Marshall clearly has the attitude and approach of more of a glue type player than an alpha scorer, and that was definitely evident here, where his team needed more of the latter against the vastly more talented St. Benedict's. This'll be much less of a problem at UNC, where he will fit in very nicely as a complementary player, and should be able to contribute from day one. For Team Allan Ray, super soph point guard Kendall Marshall (Bishop O'Connell/Arlington, VA/2010) had an unimpressive first game shooting 2-of-10 from the floor including 1-of-6 from deep. On the bright side, he did show excellent ball handling skills and a true ability to control tempo, dishing out five assists while turning the ball over just once.